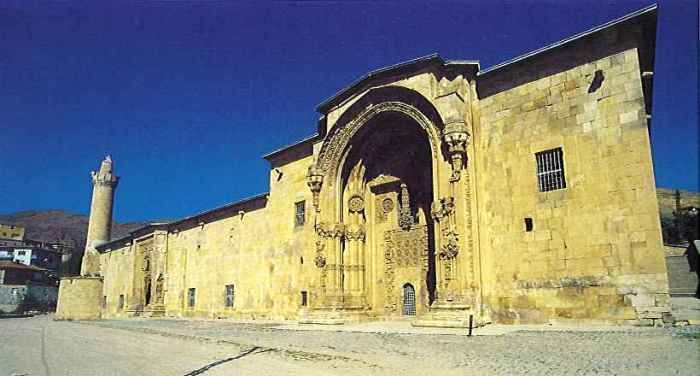 The Great Mosque and Hospital of Divrigi is the most elaborately decorated medieval monument in Anatolia (Turkey). It is well preserved and has a storied history, including use during World War II as the secret vault for the treasure of Topkapi Sarayi. The mosque was built in 1229 by the Mengujukid emir Ahmet Shah, while Melike Turhan Melek, his wife, commissioned the hospital at the same time. It is the oldest complex in Anatolia.